Gorgeous! Gorgeous! Send me a slice!!! Stunning cake! It screams Fall! Wow! This cake really is very beautiful. You did a fabulous job despite your initial nerves. I can't imagine how you could have made it any more perfect. Lovely blog you have! This looks amazing. I can't wait to try it! That's funny you say you haven't had much practice with layer cakes, because this cake looks amazing! That frosting looks delicious. That is some great detail on your decorating! I always wanted to decorate cakes growing up. Waooow it's so beautiful !! 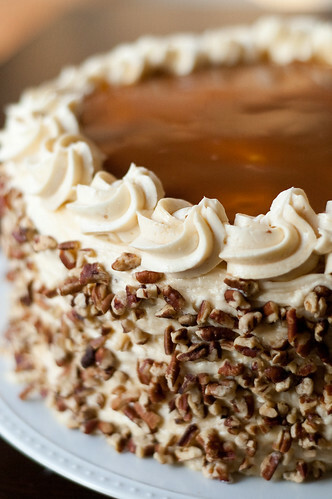 This cake sounds delicious and I love the idea of topping it with caramel. I would love to make this one for my family. As a fellow Pastry Queen lover, I bookmarked this cake pretty much as soon as I saw it. It's been a while since I looked through her Christmas book, so thanks for the reminder that I need to make it soon now that apples are in season. It looks beautiful! Wow - just wonderful. I especially love that frosting and can't wait for a reason to make it. This is one mighty fine lookin cake! Wish I had a big slice of it right now. 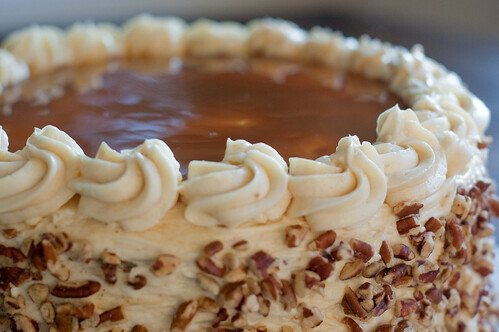 You had me at Caramel Swirl Icing. yes, please! I'd love to post this on this months Sugar High Friday's round up if you're interested. See http://zuccherodolce.blogspot.com/2010/10/sugar-high-friday-octobers-theme-is.html for details. Wow you did an amazing job with this cake!! It looks so insanely good. Mmm my grandpa asked for an apple cake for his birthday but all the ones I could find were just boring breakfast-type cakes. Until this! :) It's gorgeous and definitely birthday cake worthy. I'm positive he's gonna love it; let's just hope mine turns out as gorgeous as yours!! Looks amazing..is the caramel an ice cream topping or do we make our own? I'd love to me this for thanksgiving!! looks delish!!! can you put any kind of nut for the sides? or do you think it tastes better with walnut? This actually calls for pecans. I don't know that I'd use any nut, but I'd think that pecans, walnuts, or maybe even almonds would all be great. Is it too much batter to make this in a Bundt pan?